The statement, “One man’s terrorist is another man’s freedom fighter,” has become not only a cliché, but also one of the most difficult obstacles in coping with terrorism. The matter of definition and conceptualization is usually a purely theoretical issue—a mechanism for scholars to work out the appropriate set of parameters for the research they intend to undertake. However, when dealing with terrorism and guerrilla warfare, implications of defining our terms tend to transcend the boundaries of theoretical discussions. In the struggle against terrorism, the problem of definition is a crucial element in the attempt to coordinate international collaboration, based on the currently accepted rules of traditional warfare. Academics, politicians, security experts and journalists, all use a variety of definitions of terrorism. Some definitions focus on the terrorist organizations’ mode of operation. Others emphasize the motivations and characteristics of terrorism, the modus operandi of individual terrorists, etc. In their book Political Terrorism, Schmidt and Youngman cited 109 different definitions of terrorism, which they obtained in a survey of leading academics in the field. From these definitions, the authors isolated the following recurring elements, in order of their statistical appearance in the definitions: Violence, force (appeared in 83.5% of the definitions); political (65%); fear, emphasis on terror (51%); threats (47%); psychological effects and anticipated reactions (41.5%); discrepancy between the targets and the victims (37.5%); intentional, planned, systematic, organized action (32%); methods of combat, strategy, tactics (30.5%). 4. Is terrorism a sub-category of coercion? Violence? Power? Influence? 5. Can terrorism be legitimate? What gains justify its use? Hamilton: Well, how do you define terrorism, do you define it in terms of non-combatants? Walker: The State Department definition which is included in the terrorism report annually defines it in terms of politically motivated attacks on non-combatant targets. Hamilton: So an attack on a military unit in Israel will not be terrorism? Walker: It does not necessarily mean that it would not have a very major impact on whatever we were proposing to do with the PLO. Hamilton: I understand that, but it would not be terrorism. Walker: An attack on a military target. Not according to the definition. Now wait a minute; that is not quite correct. You know, attacks can be made on military targets which clearly are terrorism. It depends on the individual circumstances. Hamilton: Now wait a minute. I thought that you just gave me the State Department definition. Walker: Non-combatant is the terminology, not military or civilian. Hamilton: All right. So any attack on a non-combatant could be terrorism? Hamilton: And a non-combatant could include military? Hamilton: It certainly would include civilian, right? Hamilton: But an attack on a military unity would not be terrorism? Walker: It depends on the circumstances. Hamilton: And what are those circumstances? Walker: I do not think it will be productive to get into a description of the various terms and conditions under which we are going to define an act by the PLO as terrorism. Abu Iyad tries to present terrorism and political violence as two different and unconnected phenomena. The implication of this statement is that a political motive makes the activity respectable, and the end justifies the means. I will examine this point below. We have always opposed terrorism. But terrorism is one thing and a national struggle against occupation is another. We are against terrorism…Nevertheless, we support the struggle against occupation waged by national liberation movements. The conference reiterates its absolute faith in the need to distinguish the brutal and unlawful terrorist activities perpetrated by individuals, by groups, or by states, from the legitimate struggle of oppressed and subjugated nations against foreign occupation of any kind. This struggle is sanctioned by heavenly law, by human values, and by international conventions. Surprisingly, many in the Western world have accepted the mistaken assumption that terrorism and national liberation are two extremes in the scale of legitimate use of violence. The struggle for “national liberation” would appear to be the positive and justified end of this sequence, whereas terrorism is the negative and odious one. It is impossible, according to this approach, for any organization to be both a terrorist group and a movement for national liberation at the same time. The idea that one person’s ‘terrorist’ is another’s ‘freedom fighter’ cannot be sanctioned. Freedom fighters or revolutionaries don’t blow up buses containing non-combatants; terrorist murderers do. Freedom fighters don’t set out to capture and slaughter schoolchildren; terrorist murderers do . . . It is a disgrace that democracies would allow the treasured word ‘freedom’ to be associated with acts of terrorists. For in contrast to the terrorist, no freedom fighter has ever deliberately attacked innocents. He has never deliberately killed small children, or passersby in the street, or foreign visitors, or other civilians who happen to reside in the area of conflict or are merely associated ethnically or religiously with the people of that area… The conclusion we must draw from all this is evident. Far from being a bearer of freedom, the terrorist is the carrier of oppression and enslavement . . . This approach strengthens the attempt by terrorist organizations to present terrorism and the struggle for liberation as two contradictory concepts. It thus plays into the terrorists’ hands by supporting their claim that, since they are struggling to remove someone they consider a foreign occupier, they cannot be considered terrorists. The claim that a freedom fighter cannot be involved in terrorism, murder and indiscriminate killing is, of course, groundless. A terrorist organization can also be a movement of national liberation, and the concepts of “terrorist” and “freedom fighter” are not mutually contradictory. Abu Iyad here clarifies that innocent victims are civilians in countries that are not directly involved in the Arab-Israeli conflict (implying that civilians in Israel, even children and old people, are not innocent), while he describes Palestinian civilians as innocent victims. The question is whether it is at all possible to arrive at an exhaustive and objective definition of terrorism, which could constitute an accepted and agreed-upon foundation for academic research, as well as facilitating operations on an international scale against the perpetrators of terrorist activities. 1. The essence of the activity—the use of, or threat to use, violence. According to this definition, an activity that does not involve violence or a threat of violence will not be defined as terrorism (including non-violent protest—strikes, peaceful demonstrations, tax revolts, etc.). Motives are entirely irrelevant to the concept of political terrorism. Most analysts fail to recognize this and, hence, tend to discuss certain motives as logical or necessary aspects of terrorism. But they are not. At best, they are empirical regularities associated with terrorism. More often they simply confuse analysis. 3. The targets of terrorism are civilians. Terrorism is thus distinguished from other types of political violence (guerrilla warfare, civil insurrection, etc.). Terrorism exploits the relative vulnerability of the civilian “underbelly”—the tremendous anxiety, and the intense media reaction evoked by attacks against civilian targets. The proposed definition emphasizes that terrorism is not the result of an accidental injury inflicted on a civilian or a group of civilians who stumbled into an area of violent political activity, but stresses that this is an act purposely directed against civilians. Hence, the term terrorism should not be ascribed to collateral damage to civilians used as human shields or to cover military activity or installations, if such damage is incurred in an attack originally aimed against a military target. In this case, the responsibility for civilian casualties is incumbent upon whoever used them as shields. The proposed definition of terrorism also addresses a lacuna in present international legislation and international conventions, in order to develop a fundamental tool for international cooperation against terrorism. In order to achieve as wide an accord as possible, this definition must be founded on a system of principles and laws of war, legislated and ratified in many countries. In other words, in order to reach an accepted definition of terrorism, we must extrapolate from the existing principles of conventional warfare (between countries) to arrive at similar principles for non-conventional warfare (for our purposes, a violent struggle between an organization and a state). Many countries in the world support the view—and have enshrined this in international conventions—that we must differentiate between two types of military personnel who make use of force to attain their aims. On the one hand there are ‘soldiers’—members of the military who intentionally target members of rival armies, and on the other, there are ‘war criminals’—members of the military who intentionally harm civilians (see Diagram 1). This normative and accepted attitude toward military personnel operating in a situation of conventional warfare enables us to extrapolate to situations of non-conventional warfare (between an organization and a state), thus allowing us to distinguish terrorism from guerrilla warfare. As noted, terrorism is “a violent struggle intentionally using, or threatening to use, violence against civilians, in order to attain political aims,” whereas guerrilla warfare is “a violent struggle using (or threatening to use) violence against military targets, security forces, and the political leadership, in order to attain political aims.” Terrorism is thus different from guerrilla warfare in its mode of activity and in the targets chosen by the perpetrators. The only question to be resolved is whether perpetrators choose to attain their aims by targeting civilian or military targets? Terrorism and guerrilla warfare often serve as alternative designations of the same phenomenon. The term “terrorism,” however, has a far more negative connotation, seemingly requiring one to take a stand, whereas the term “guerrilla warfare” is perceived as neutral and carries a more positive connotation. One of the problems accompanying the use of the concept guerrilla warfare stems from its ambiguity. This nebulousness is cited by Yehoshafat Harkabi in differentiating between guerrilla warfare and guerrilla war. Harkabi describes guerrilla war as a prolonged war of attrition, with progressively increasing violence, blurred limits, a fluid line of contact, emphasizing the human factor. In the course of the war, guerrilla combatants become regular military forces until victory is attained and one party is defeated. Similarly, Huntington argues that “guerrilla warfare is a form of warfare by which the strategically weaker side assumes the tactical offensive in selected forms, times and places. Guerrilla warfare is the weapon of the weak.” Harkabi points out that terrorism frequently appears in guerrilla war, and indicates that “guerrilla activity is best placed on a sequence, ranging from sporadic terrorist attacks not necessarily against military units, up to sustained guerrilla warfare and confrontation with military forces.” Others view guerrilla war and terrorism as two separate points along one sequence dealing with the use of violence. The essence of guerrilla warfare is to establish foci, or liberated areas, in the countryside and to set up small military units which will gradually grow in strength, number and equipment . . . in order to fight battles against government troops. In the liberated areas, the guerrillas establish their own institutions, conduct propaganda and engage in other open political activities. None of this applies to terrorists, whose base of operation is in the cities, and who have to operate clandestinely in small units. Guerrillas may fight with small numbers and often inadequate weaponry, but they can and often do fight according to conventions of war, taking and exchanging prisoners and respecting the rights of non-combatants. Terrorists place no limits on means employed and frequently resort to widespread assassination, the waging of ‘general terror’ upon the indigenous civilian population. The proposed definition, as noted, distinguishes terrorism from guerrilla activity according to the intended target of attack. The definition states that if an attack deliberately targets civilians, then that attack will be considered a terrorist attack, whereas, if it targets military or security personnel then it will be considered a guerrilla attack. It all depends on who the intended victims are. First and foremost, this definition is meant to answer the need for analyzing and classifying specific events as terrorism or guerrilla activities. This definition is not meant to differentiate between the types of perpetrating organizations. Most organizations resorting to violence for the purpose of attaining political aims have not refrained from harming civilians as well as military personnel. These organizations, then, can be defined as both terrorist organizations and guerrilla movements. Although the proposed definition relates to specific attacks, it is still possible to deduce from it whether a particular organization is a terrorist organization or a guerrilla movement. One could, for instance, rely on a quantitative principle—comparing the numbers of terrorist attacks and guerrilla attacks within the total number of violent activities involving the organization. Or one could rely on a qualitative principle, stating that every organization engaging in attacks against civilian targets is a terrorist organization, and it is irrelevant whether at the same time the same organization was also involved in guerrilla activities. Hence, the claim that every guerrilla organization has also harmed civilians does not affect the proposed definition of terrorism. A situation where organizations are involved simultaneously in terrorism and guerrilla activity is a direct consequence of the lack of an accepted international definition for terrorism and guerrilla warfare. Only a definition agreed upon by most countries in the world—and which entails operative action against terrorist groups different from that directed against guerrilla groups—will move these organizations to take cost-benefit considerations into account when choosing the mode of activity appropriate to attaining their ends. When the damage incurred by organizations due to their engagement in terrorism is greater than the damage they incur due their involvement in guerrilla activities, it is plausible to assume that some organizations will choose to focus on guerrilla activities rather than terrorism. As long as there is no accepted international convention for distinguishing terrorism from guerrilla activity—and as long as such convention is not accompanied by different levels of punitive sanctions—it should come as no surprise that organizations choose to engage in terrorism or in guerrilla activities according to their own operative limitations or circumstances. is greater than the damage they incur due to their involvement in guerrilla activities, it is plausible to assume that some organizations will choose to focus on guerrilla activities rather than on terrorism. As long as there is no accepted international convention for distinguishing terrorism from guerrilla activity—and as long as such convention is not accompanied by different levels of punitive sanctions—it should come as no surprise that organizations choose to engage in terrorism or in guerrilla activities according to their own operative limitations or circumstances. Nor does the claim that terrorism and guerrilla activities are on one conceptual sequence—to the extent that it has empirical backing—contradict the classification of terrorism and guerrilla activity according to the proposed definition. A situation is certainly possible in which an organization might decide to move from the stage of terrorism to the stage of guerrilla warfare, and vice-versa, thereby changing its character from one involved only in, or mainly in, terrorism, to one involved mainly in guerrilla warfare. According to the above definitions, the difference between individual terrorism and urban guerrilla warfare again hinges on the identity of the intended target. An attack against military personnel, or against a leading decision-maker who formulates policy (including counter-terrorist policy), could be considered, according to the proposed definition, an “urban guerrilla” activity. However, if the target is a civilian not acting in a decision-making capacity, but merely someone who is at most a political or social symbol (a well known singer, a journalist, a past leader, a judge, the head of a community or ethnic group, etc. ), this will be an act of “individual terrorism” according to the proposed definition. For the purpose of defining terrorism, the type of goal sought is irrelevant (so long as the goal is political). The terrorist and the guerrilla fighter may have the exact same aims, but they choose different means to accomplish them. Among the political aims that different organizations (both terrorist organizations and guerrilla movements) seek to achieve we might mention: national liberation (liberating territory from an occupying power); revolution (changing the government); anarchism (creating chaos); changing the prevalent socio-economic system, etc. By characterizing terrorism as a mode of operation directed against civilian targets, as opposed to basing the definition on the goals of the violence, we refute the slogan that “one man’s ‘terrorist’ is another man’s ‘freedom fighter’.” This distinction between the target of the attack and its aims shows that the discrepancy between “terrorism” and “freedom fighting” is not a subjective difference reflecting the personal viewpoint of the definer. Rather it constitutes an essential difference, involving a clear distinction between the perpetrators’ aims and their mode of operation. As noted, an organization is defined as “terrorist” because of its mode of operation and its target of attack, whereas calling something a “struggle for liberation” has to do with the aim that the organization seeks to attain. Diagram 2 (No diagram in this paper) illustrates that non-conventional war (between a state and an organization), may include both terrorism and guerrilla activities on the background of different and unrelated aims. Hiding behind the guise of national liberation does not release terrorists from responsibility for their actions. Not only is it untrue that “one man’s terrorist is another man’s freedom fighter” but it is also untrue that “the end justifies the means.” The end of national liberation may, in some cases, justify recourse to violence, in an attempt to solve the problem that led to the emergence of a particular organization in the first place. Nevertheless, the organization must still act according to the rules of war, directing its activities toward the conquest of military and security targets; in short, it must confine itself to guerrilla activities. When the organization breaks these rules and intentionally targets civilians, it becomes a terrorist organization, according to objective measures, and not according to the subjective perception of the definer. It may be difficult at times to determine whether the victim of an attack was indeed a civilian, or whether the attack was intentional. These cases could be placed under the rubric of a “gray area,” to be decided in line with the evidence and through the exercise of judicial discretion. The proposed definition may therefore be useful in the legal realm as a criterion for defining terrorism will considerably reduce the gray area to a few marginal cases and categorizing the perpetrators’ activities. On the basis of this definition of terrorism and guerrilla warfare, how should we define the involvement of states in the performance terrorist attacks? Note that violent activities committed by a state against civilians are forbidden by international conventions and are clearly defined as ‘war crimes’ (in the context of a war situation) and as ‘crimes against humanity’ (in other situations). Thus, whereas these definitions have led to the international delegitimation of the use of violence against civilians by military personnel and political leaders, a lacuna still exists concerning the use of violence against civilians by organizations or individuals on political grounds. States can be involved in terrorism in various ways: from various levels of general support for terrorist organizations, through operational assistance, initiating or directing attacks, and up to the perpetration of terrorist attacks by official state agencies. All forms of state involvement in terrorism are usually placed under the general category of “terrorist states,” or “state sponsored terrorism.” Such a designation has taken on the character of a political weapon; rival states ascribe it to one another, and terrorist organizations use it against states acting against them. 1. “States supporting terrorism” - states that support terrorist organizations, providing financial aid, ideological support, military or operational assistance. 2. “States operating terrorism” - states that initiate, direct and perform terrorist activities through groups outside their own institutions. 3. “States perpetrating terrorism” - states perpetrating terrorist acts abroad through their own official bodies–members of its security forces or its intelligence services, or their direct agents. In other words, states intentionally attacking civilians in other countries in order to achieve political aims without declaring war. As mentioned above, according to international conventions, intentional acts of aggression against civilians by official agencies of a state, either at times of war or in occupied territories, will be considered war crimes rather than terrorism. Various countries have engaged in attacks against leading activists of terrorist organizations—planners and initiators of attacks, commanders of operational units, saboteurs and even the organizations’ leaders. On such grounds, these countries have often been accused of engaging in terrorism. According to the proposed definition of terrorism (and setting aside questions bearing on the legitimate confines of a struggle against terrorism and on the rights of states to fight terrorists in the territory of another sovereign state), actions by a state against terrorist activists cannot be defined as terrorism, even if only because the latter are not actually civilians. Individuals engaging in terrorist activities, even if not wearing a uniform, exclude themselves from the civilian community, and rules protecting civilians no longer apply to them. Thus, just as the definition views decision-makers as “legitimate” targets in guerrilla warfare, so targeting terrorists who head operational, administrative or political branches in a terrorist organization should not itself be considered a terrorist activity, since these are the people responsible for policy formulation and decision making in the organization. As noted, defining terrorism is not merely a theoretical issue but an operative concern of the first order. Terrorism is no longer a local problem of specific countries but an issue involving a number of international aspects. Terrorist organizations may perpetrate attacks in a variety of countries; the victims of attacks can be of different nationalities; the offices, headquarters, and training camps of terrorist organizations function in various countries; terrorist organizations receive direct and indirect assistance from different states, enlist support from different ethnic communities, and secure financial help throughout the world. Since terrorism is an international phenomenon, responses to terrorism must also be on an international scale. Developing an effective international strategy requires agreement on what it is we are dealing with, in other words, we need a definition of terrorism. 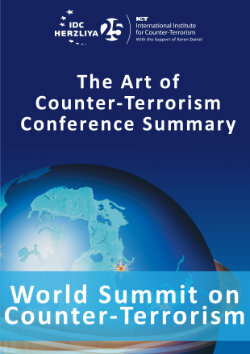 International mobilization against terrorism, such as that which began in the mid-nineties and culminated in the international conventions in the G-7 countries, the Sharem el-Sheik Conference, etc., cannot lead to operational results as long as the participants cannot agree on a definition. Without answering the question of “what is terrorism,” no responsibility can be imposed on countries supporting terrorism, nor can steps be taken to combat terrorist organizations and their allies. For a look at recent efforts along these lines, see Security Council Resolution 1269: What it Leaves Out , and the Full text of UN Security Counsel Resolution 1269. Without a definition of terrorism, it is impossible to formulate or enforce international agreements against terrorism. A conspicuous example of the need to define terrorism concerns the extradition of terrorists. Although many countries have signed bilateral and multilateral agreements concerning a variety of crimes, extradition for political offenses is often explicitly excluded, and the background of terrorism is always political. This loophole allows many countries to shirk their obligation to extradite individuals wanted for terrorist activities. It isn’t only countries like Italy and France that have refrained from extraditing terrorists, adducing political motives. In the U.S. too, in June 1988, a Brooklyn judge rejected the plea of a federal prosecutor requesting the extradition of Abed El Atta (an American citizen suspected of participating in an attack against a bus in the West Bank in April 1986, in which four people were killed). The judge stated that this attack was a “political act,” part of the uprising in the occupied territories, and instrumental in the attainment of the PLO’s “political aims.” “In the West Bank, today’s rebels could be tomorrow’s rulers.” According to the judge, this is a “political charge,” excluded from the category of crimes included in the extradition treaty between Israel and the United States. 1. Legislation and punishment – The laws and regulations enacted to provide security forces with an instrument for combating terrorism. A definition of terrorism is necessary when legislating laws designed to ban terrorism and assistance to terrorism, as well as when setting minimum sentences for terrorists or confiscating their financial resources and supplies. Barring an accepted definition, this legislation has no value. Legislation and punishment must distinguish terrorism from ordinary crime, even when they might actually be identical in practice. The need for a separate legislation and punishment for terrorism stems from the enormous danger that terrorism, due to its political dimension, as opposed to crime, poses to society and its values, to the government in power, and to the public at large. 2. International cooperation – An internationally accepted definition of terrorism is required to strengthen cooperation between countries in the struggle against terrorism, and to ensure its effectiveness. This need is particularly obvious in all that concerns the formulation and ratification of international conventions against terrorism— conventions forbidding the perpetration of terrorist acts, assistance to terrorism, transfer of funds to terrorist organizations, state support for terrorist organizations, commercial ties with states sponsoring terrorism– and conventions compelling the extradition of terrorists. 3. States sponsoring terrorism – Modern terrorism is increasingly dependent on the support of nations. States sponsoring terrorism without severing the close tie between the terrorist organizations and the sponsoring states. This tie, however, cannot be severed without agreeing on a broad definition of terrorism, and thus of the states that sponsor it and of the steps to be taken against them. State sponsors of terrorism use terrorist organizations as a means to their own ends, while these organizations depend on the assistance they receive from such countries at the economic, military, and operational levels. Some organizations are so closely dependent on the assistance of states that they become “puppets” functioning at the initiative, direction, and with the complete support of these states. 4. Offensive action – The state struggling against terrorism must retain the initiative. At the same time, attempts must be made to limit, as far as possible, the operative capacity of the terrorist organization. To attain these aims, a continued offensive must be conducted against terrorist organizations. While countries on the defensive naturally enjoy the sympathy of others, countries on the offensive are usually censored and criticized by others. To ensure international support for states struggling against terrorism, and perhaps even for a joint offensive, an internationally accepted definition of terrorism is required that will distinguish freedom fighting (which enjoys a measure of legitimacy among nations) from terrorist activity. 5. Attitudes toward the population supporting terrorism – Terrorist organizations often rely on the assistance of a sympathetic civilian population. An effective instrument in the limitation of terrorist activity is to undermine the ability of the organization to obtain support, assistance, and aid from this population. A definition of terrorism to attain its political aims could be helpful here too by determining new rules of the game in both the local and the international sphere. Any organization contemplating the use of terrorism will have to risk losing its legitimacy, even with the population that supports its aims. 6. Public relations – a definition that separates terrorism out from other violent actions will enable the initiation of an international campaign designed to undermine the legitimacy of terrorist organizations, curtail support for them, and galvanize a united international front against them. In order to undermine the legitimacy of terrorist activity (usually stemming from the tendency of various countries to identify with some of the aims of terrorist organizations), terrorist activity must be distinguished from guerrilla activity, as two forms of violent struggle reflecting different levels of illegitimacy. The definition of terrorism does not require that the terrorist organizations themselves accept it as such. Nevertheless, reaching international agreement will be easier the more objective the definition, and the more the definition takes into account the demands and viewpoints of terrorist organizations and their supporters. The proposed definition, as noted, draws a distinction between terrorism and guerrilla warfare at both the conceptual and moral levels. If properly applied, it could challenge organizations that are presently involved in terrorism to abandon it so as to engage exclusively in guerrilla warfare. As noted, most organizations active today in the national and international arena engage in both terrorist activities and guerrilla warfare; after all, international convention makes no distinction between the two. Hence, there are no rules defining what is forbidden and what is allowed in non-conventional war, and equal punishments are imposed on both terrorists and guerrilla fighters. People perpetrating terrorist attacks or engaging in guerrilla warfare know they can expect the same punishment, whether they attack a military installation or take over a kindergarten. The terrorist attack may be more heavily censored because it involves children, but the legitimacy of these actions will be inferred from their political aims. In these circumstances, why not prefer a terrorist attack that will have far more impact, and will be easier to accomplish, with much less risk? The international adoption of the proposed definition, with its distinction between terrorism and guerrilla warfare—and its concomitant separation from political aims—could motivate the perpetrators to reconsider their intentions, choosing military targets over civilian targets—guerrilla warfare over terrorism–both because of moral considerations and because of “cost-benefit” considerations. The moral consideration – Many terrorist organizations are troubled by the moral question bearing on their right to harm civilians, and this concern is reflected in their literature and in interviews with terrorists. Thus, for instance, an activist of the Popular Front for the Liberation of Palestine, Walid Salam, argued in December 1996 that “among activists of the Popular Front, more and more are opposed to military activities against civilians, as the one near Ramallah on Wednesday. They do not say so publicly because of internal discipline and to preserve unity.” We can also see something of this moral dilemma in Sheik Ahmad Yassin, the leader of Hamas: “According to our religion it is forbidden to kill a woman, a baby, or an old man, but when you kill my sister, and my daughter, and my son, it is my right to defend them.” This concern might explain why, after attacks on civilian targets, organizations such as Hamas often make public statements proclaiming that they have attacked military targets. The moral dilemma does exist, and the opponents of terrorism must intensify it. When countries acknowledge the principle of relying on guerrilla warfare to attain legitimate political aims, and unite in their moral condemnation of terrorism, they increase the moral dilemma that is already prevalent in terrorist organizations. The utilitarian consideration – If the perpetrators know that attacking a kindergarten or other civilian target will never be acceptable; that these attacks will turn them into wanted and extraditable terrorists and will undermine the legitimacy of their political goals—and that, when apprehended, they will be punished much more harshly than would guerrilla fighters—they may think twice before choosing terrorism as their modus operandi. Adopting the proposed definition of terrorism, formulating rules of behavior, and setting appropriate punishments in line with the proposed definition will sharpen the cost-benefit considerations of terrorist organizations. One way of encouraging this trend among terrorist organizations is, as noted, to agree on different punishments for those convicted of terrorism and those convicted of guerrilla warfare. Thus, for instance, the possibility should be considered of bringing to criminal trial, under specific charges of terrorism, individuals involved in terrorist activities, while allotting prisoner of war status to those accused of involvement in guerrilla activities. The proposed definition of terrorism may indeed help in the struggle against terrorism at many and varied operative levels. An accepted definition, capable of serving as a basis for international counter-terrorist activity, could above all, bring terrorist organizations to reconsider their actions. They must face the question of whether they will persist in terrorist attacks and risk all that such persistence entails—loosing legitimacy, incurring harsh and specific punishments, facing a coordinated international opposition (including military activity), and suffering harm to sources of support and revenue. The international community must encourage the moral and utilitarian dilemmas of terrorist organizations, and establish a clear policy accompanied by adequate means of punishment on the basis of an accepted definition. We face an essential need to reach a definition of terrorism that will enjoy wide international agreement, thus enabling international operations against terrorist organizations. A definition of this type must rely on the same principles already agreed upon regarding conventional wars (between states), and extrapolate from them regarding non-conventional wars (between organization and a state). The definition of terrorism will be the basis and the operational tool for expanding the international community’s ability to combat terrorism. It will enable legislation and specific punishments against those perpetrating, involved in, or supporting terrorism, and will allow the formulation of a codex of laws and international conventions against terrorism, terrorist organizations, states sponsoring terrorism, and economic firms trading with them. At the same time, the definition of terrorism will hamper the attempts of terrorist organizations to obtain public legitimacy, and will erode support among those segments of the population willing to assist them (as opposed to guerrilla activities). Finally, the operative use of the definition of terrorism. could motivate terrorist organizations, due to moral or utilitarian considerations, to shift from terrorist activities to alternative courses (such as guerrilla warfare) in order to attain their aims, thus reducing the scope of international terrorism. The struggle to define terrorism is sometimes as hard as the struggle against terrorism itself. The present view, claiming it is unnecessary and well-nigh impossible to agree on an objective definition of terrorism, has long established itself as the politically correct one. It is the aim of this paper, however, to demonstrate that an objective, internationally accepted definition of terrorism is a feasible goal, and that an effective struggle against terrorism requires such a definition. The sooner the nations of the world come to this realization, the better. 1. Alex P. Schmidt and Albert I. Jongman et al., Political Terrorism (SWIDOC, Amsterdam and Transaction Books, 1988), p. 5 (henceforth Schmidt). 3. Hearings and Markup before the Subcommittee on Europe and the Middle East of the Committee on Foreign Affairs, House of Representatives, One Hundred First Congress, First Session, p. 66. 4. Abu Iyad, Without a Homeland (Tel-Aviv: Mifras, 1983) [Hebrew], p. 146 (henceforth Abu Iyad). 5. Tishrin, Syria, November 17, 1986. 6. Al-Anba’a, Kuwait, January 30, 1987. 7. Haaretz, April 21, 1998 and ICT Internet Site (http://www.ict.org.il/Article/1585/Arab-League-Nations-Sign-Anti-terror-Accord). 8. Ray S. Cline and Yonah Alexander, Terrorism as State-Sponsored Covert Warfare (Virginia: Hero Books, 1986) p. 24 (henceforth Cline). 9. Binyamin Netanyahu, Terrorism: How the West Can Win (New York: Farrar, Strauss and Giroux, 1985), p. 18 (henceforth Netanyahu). 12. Binyamin Netanyahu, Fighting Terrorism (New York: Farrar, Strauss and Giroux, 1995), p. 8. 13. Abu Iyad, pp. 78, 155-156. 14. Alex P. Schmidt, Political Terrorism (SWIDOC, Amsterdam and Transaction Books, 1984), p. 100 (henceforth Political Terrorism). 15. Yehoshafat Harkabi, On Guerrilla Warfare (Tel-Aviv: Ma’arakhot, 1983) [Hebrew], p. 27 (henceforth Harkabi). 17. Walter Laqueur, Guerrilla Warfare, a Historical and Critical Study (Weidenfeld & Nicholson, London, 1977), p. 392. 19. Political Terrorism, p. 41. 20. Walter Laqueur, The Age of Terrorism (Boston-Toronto: Little Brown, 1987), p. 1 (henceforth Laqueur). 22. In a lecture at a workshop on “Israel and Terrorism,” sponsored by the International Center for the Study of Contemporary Society, Jerusalem, 1985. 23. Political Terrorism , p. 44. 24. Political Terrorism, p. 42. 25. Political Terrorism, p. 39. 26. 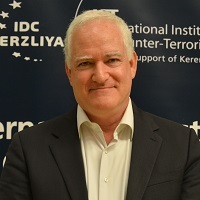 Boaz Ganor, “Countering State-Sponsored Terrorism” (Herzlia: ICT Papers, The International Policy Institute for Counter-Terrorism, The Interdisciplinary Center, 1997), p. 7. 27. Haaretz, December 15, 1996. 28. Haaretz, October 8, 1997.